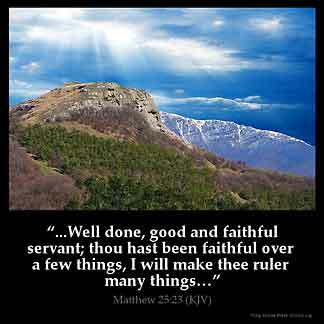 MATTHEW 25:23 KJV "His lord said unto him, Well done, good and faithful servant; thou hast been faithful over a few things,..."
His lord said vnto him, Well done, good and faithfull seruant, thou hast beene faithfull ouer a few things, I wil make thee ruler ouer many things: enter thou into the ioy of thy lord. Y haue wonnen ouer othir tweyne. His lord seide to him, Wel be thou, good seruaunt and trewe; for on fewe thingis thou hast be trewe, Y schal ordeyne thee on many thingis; entre thou in to the ioie of thi lord. I have to wonder what is faithfulness and how faithful am i? there is coming a day when I will stand before God Almighty and give an account of everything I ever die in this life. It is my prayer that He will be able to say Well done thou good and faithful servant. I want to walk so as to please my Lord !!! !